The basketball card market of the 1950s and 1960s is filled with high-dollar vintage cards and scarce releases. However, despite only a few products being released during the period, there are actually a good amount of Hall of Fame basketball rookie cards available for budget prices. When talking about the earliest period of basketball cards, there are really just four main products. 1948 Bowman was the first release and most expensive across the board. While 1957-58 Topps includes premium rookie cards for Bill Russell and Bob Cousy, there are multiple cheap HOF rookie cards in this vintage product. 1961-62 Fleer is a little pricier because of several huge rookie names, like Wilt Chamberlain, Jerry West and Oscar Robertson, but there are still deals to be found. Lastly, 1969-70 Topps rounds out the decade with tallboy cards. Outside of Lew Alcindor, many Hall of Fame rookie cards can be found for reasonable amounts. The following list includes 20 Hall of Fame rookie cards from the first two decades of pro basketball cards for under $50. Many of these cards can be found for much less than $50 and some for as little as $5. This price point is based on the raw grade values, and mid- and high-grades can command significant premiums. Given the age of these cards and the printing quality at this time, it is very important to inspect cards throughly before making any purchase. Part Lurch and part American Gothic, Neil Johnston is a scary-looking HOF player. Although he started his professional career with the Philadelphia Phillies minor league baseball team in Terre Haute, the six-time NBA All-Star won a title in 1956 with the Philadelphia Warriors and was the NBA scoring champion in three consecutive seasons. Based on the placement of specific cards on the printing sheets, over half the checklist was double printed. This includes Johnston's rookie card. Collectors should be aware that reprints for many of the 1957-58 Topps cards were released in 1996 Topps Star. 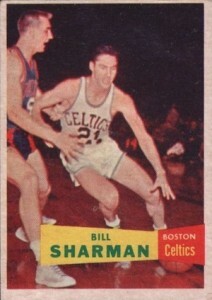 Bill Sharman won four NBA championships and was an eight-time NBA All-Star as part of the early Boston Celtics' dynasty. He also spent several seasons with the Brooklyn Dodgers minor league system during the early part of his NBA career. 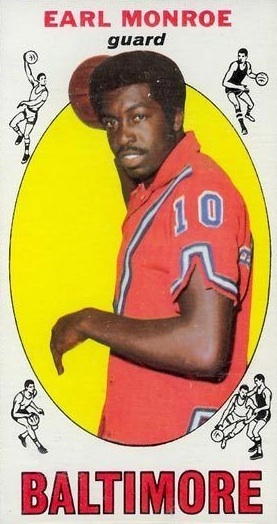 Sharman's rookie card is part of the double-printed group as well. 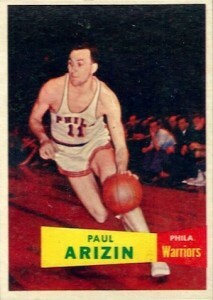 Although he played before the league officially recognized the ROY, Paul Arizin was selected by newspaper writers as the 1951 Rookie of the Year. 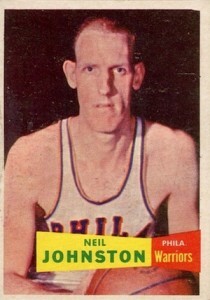 Paired with Neil Johnston, Arizin would go on to win an NBA championship in 1956 with the Philadelphia Warriors and was named to ten NBA All-Star games. Paul Arizin's rookie was also among the double prints from 1957-58 Topps. Adolph Schayes spent his entire career with the the Syracuse Nationals / Philadelphia 76ers franchise and helped the Nationals take the 1955 NBA title. The 12-time NBA All-Star was known for his impressive shooting accuracy. 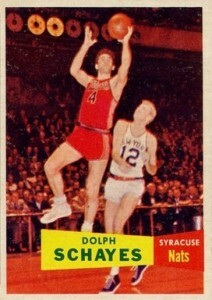 Dolph Schayes's rookie was double-printed in the 1957-58 Topps set. 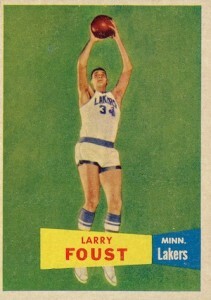 The vivid green background, instead of a dimmed action shot, makes this HOF rookie card for Larry Foust stand out from the rest. 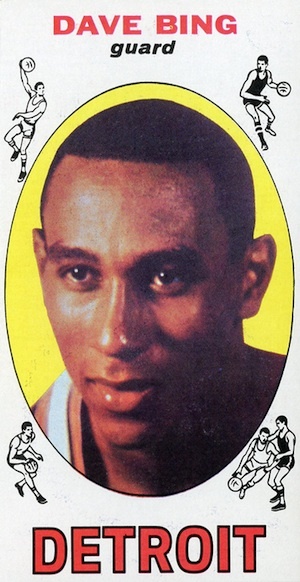 Foust amassed eight NBA All-Star appearances over his NBA career, but was never able to bring home the championship trophy. Following a trend with 1957-58 Topps, this rookie is also double printed. Arguably one of the biggest names in the NBA from this era, Bob Pettit was an 11-time NBA All-Star, two-time MVP and four-time All-Star MVP. 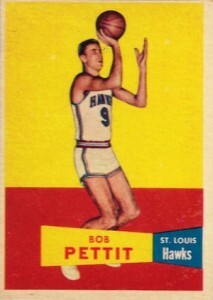 He led the St. Louis Hawks to the NBA title in 1958. It might seem odd that his 1957-58 Topps rookie is on a budget collecting guide, but due to a print run that was four-times higher than some of the cards from the set, Bob Pettit is one of the biggest budget values in this group of HOF players. Dual background coloring gives the card a unique look, especially in comparison to other cards from the set. It is important to note that most low-end values for Bob Pettit's sole rookie are close to the $50 mark. Walt Bellamy is regularly overlooked by casual fans, but he was a scoring force in his first few seasons and actually put forth his best year, and one of the best seasons of all-time, as a rookie. 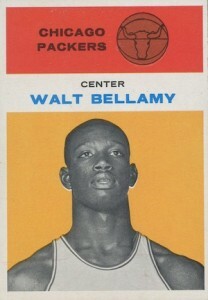 Naturally, Bellamy was named the 1962 NBA Rookie of the Year, but he moved around the league a lot after that and finished his career with no titles and four All-Star appearances. He also won an Olympic Gold Medal with the 1960 US team. An important note for all of the 1961-62 Fleer cards is that they are normally less common on the resale market than other products on this list. 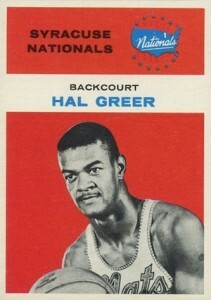 Playing for the Syracuse Nationals / Philadelphia 76ers franchise for his entire career, Hal Greer in another prominent guard from the early period of basketball. 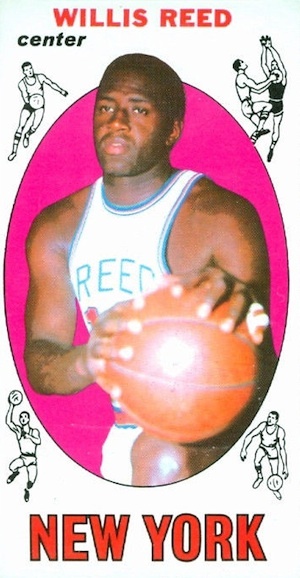 Greer was named to ten consecutive NBA All-Star teams and won the All-Star MVP in 1968. Ending the Celtics' dominant run atop the NBA, the 76ers defeated the San Francisco Warriors to take the 1967 NBA Finals. In addition to Greer, the 76ers were filled with HOF talent during their title run, including Wilt Chamberlain, Billy Cunningham and Chet Walker. 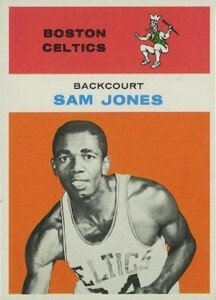 Sam Jones spent his entire pro career with the Boston Celtics dynasty of the 1960s. He won an astounding ten NBA championships, which remains the second highest total for any player in history. His former teammate, Bill Russell, holds the record with 11 titles. Generally considered one of the best shooting guards of the 1960s, Jones was a five-time NBA All-Star. His rookie card is another example that teeters closely to the $50 mark, but when they surface, the colorful cards can generally be found for under that amount in low grade or raw. Of all products to utilize the tallboy format, the oversized cards seem to work best with basketball players. 1969-70 Topps was one of these products and Nate Thurmond starts things off. Thurmond looks pretty old for a rookie, but that is because he was drafted in 1963. 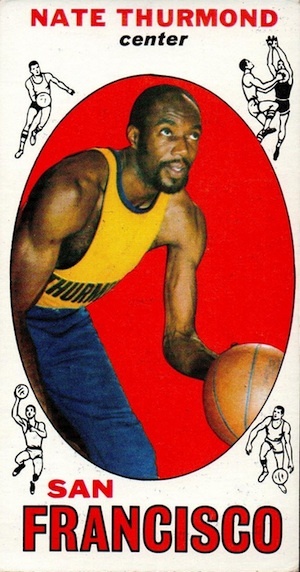 Primarily known for his rebounding and defense, Nate Thurmond was a seven-time NBA All-Star. Because of his alleged involvement in a college gambling scandal, Connie Hawkins took an unlikely route to the NBA. Although he was ultimately cleared of any wrongdoing, Hawkins was named in a 1961 point-shaving ring while at the University of Iowa. Despite being only a freshman at the time and unable to even play on the varsity team because of NCAA rules, Hawkins was expelled from school and later banned from the NBA. With few other options, he played for the American Basketball League (ABL), but the league folded after his first year. He then spent several years with the Harlem Globetrotters before moving to the newly-created pro league, the American Basketball Association (ABA). 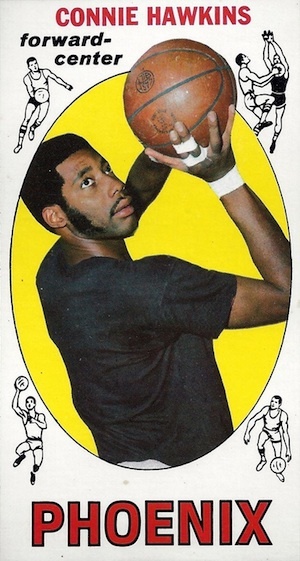 Finally, as the result of a lawsuit against the NBA, Connie Hawkins was permitted to join the NBA in 1969. Despite missing formative college and NBA years and battling reoccurring knee problems, Hawkins still put forth a productive NBA career. 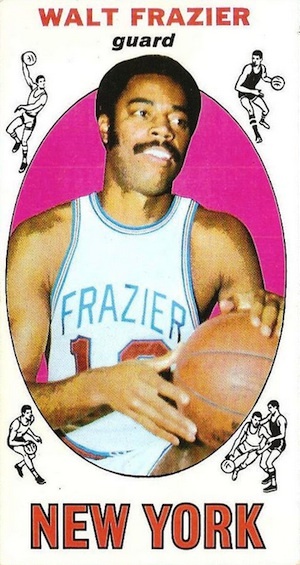 He retired as a four-time NBA All-Star, and totaled an impressive 1968 award haul in the ABA. Hawkins was named the league MVP and Playoffs MVP on his way to the ABA title. 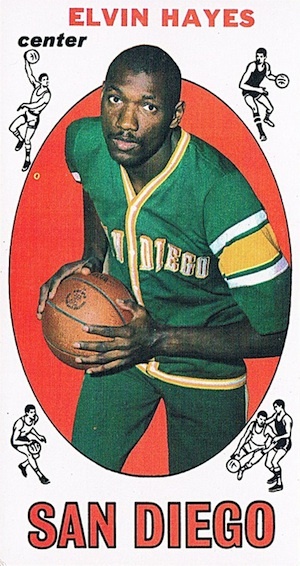 He was also an ABA All-Star in 1968. Connie Hawkins was nicknamed "The Hawk," because of his streetball skills as a kid in NYC. When comparing Hall of Famers, it is always tougher to rank players when they are all clearly elite. 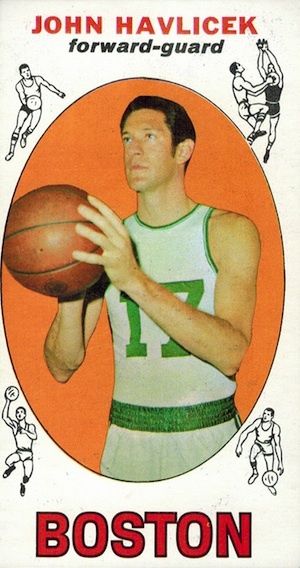 However, among this era of basketball, John Havlicek stands among the best overall players. A main cog in the Boston Celtics' machine, Havlicek was an eight-time NBA champion, 13-time NBA All-Star and the NBA Finals MVP in 1974. In regards to his rookie cards, even mid-grades can be found at or below $50. Born in Middletown, Ohio, Jerry Lucas spent a majority of his basketball career in his home state. He played college basketball at Ohio State University, and led the team to the NCAA title in 1960. Lucas was twice named the NCAA Tournament Most Outstanding Player and AP Player of the Year. While in school, he also helped lead the US team to Olympic Gold in the 1960 Olympics. 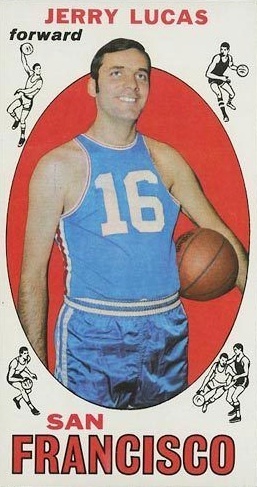 After missing the entire 1962-63 NBA season because he signed a deal with the soon-defunct ABL, the Cincinnati Royals selected Jerry Lucas with their territorial pick and he won the Rookie of the Year Award in his debut season. The seven-time NBA All-Star would later play for the San Francisco Warriors and New York Knicks, winning a title with the Knicks in 1973. The former mayor of Detroit, Dave Bing could hoop with the best in his prime. The Detroit Pistons took him second overall in the 1966 NBA Draft and Bing would win the Rookie of the Year award and would later add seven NBA All-Star appearances and two All-Star MVP awards to his résumé. Dave Bing was also the NBA scoring leader in 1968. Although several players on the list got off to a strong start in the NBA, Wes Unseld might have them all beat. 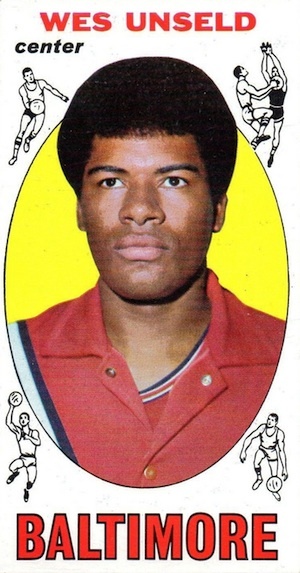 Drafted by the Baltimore Bullets with the second pick in the 1968 NBA Draft, Unseld won both the Rookie of the Year and the MVP in his first season. It would take nearly another decade, but Wes Unseld finally won his sole NBA title in 1978 and also added a Finals MVP award. He spent his entire career with the Washington / Baltimore Bullets franchise, earning five All-Star nods. Willis Reed was a member of the New York Knicks for his whole career, winning NBA titles and Finals MVP awards in 1970 and 1973. He was also the MVP during the 1970 season, and totaled seven All-Star appearances. Although only 6'9", he played both power forward and center. After a terrific college career at the University of Houston, Elvin Hayes was drafted first overall by the San Diego Rockets in 1968. Hayes played for the San Diego / Houston Rockets and the Baltimore / Washington Bullets during his prolific career and won his only title with Wes Unseld and the Washington Bullets in 1978. Also impressive, Elvin Hayes was named to 12 consecutive All-Star teams. Earl "the Pearl" Monroe is remembered as one of the most dynamic on-court players, honing his skills on the playgrounds of Philadelphia. Many know him by his other nickname, "Black Jesus." Monroe was taken second overall by the Baltimore Bullets, and after winning the Rookie of the Year, spent several more years with the team before being traded to the New York Knicks. While there, he was paired with another HOF guard, Walt Frazier, and brought the Knicks a title in 1973. Monroe finished as a four-time All-Star, but his career was cut short by knee problems. Although he was not overly large for a forward at 6'6", Dave DeBusschere played big and was most celebrated for his strong defense. The territorial pick by the Detroit Pistons in 1962, DeBusschere also played for the New York Knicks during his 12-year career. He won two titles with the Knicks in 1970 and 1973 and was an eight-time NBA All-Star. 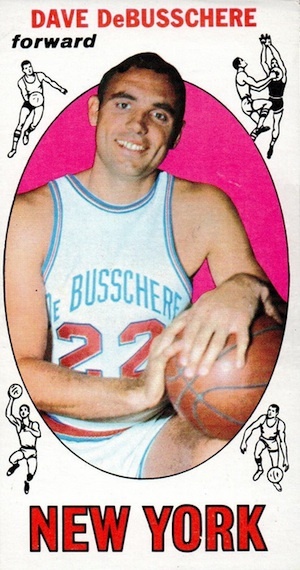 Early in his career, Dave DeBusschere also played pro baseball for the Chicago White Sox for a short time before quitting to concentrate on basketball. The third consecutive Hall of Fame rookie on the list who won a title with the Knicks, Walt Frazier won titles with Dave DeBusschere and Willis Reed in 1970 and 1973, and with Earl Monroe and Jerry Lucas in 1973. He was a seven-time NBA All-Star and moved into basketball broadcasting after he retired. 1969 Topps #43 Bill Bradley RC - PSA NM 7 - New York Knicks - CENTERED!